I used Plaid Maker to create my background. 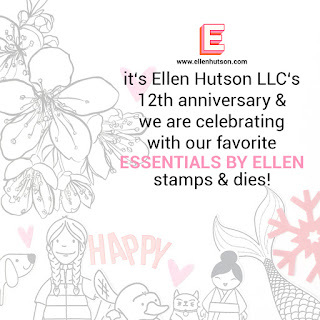 I stamped the solid block image in black ink onto red cardstock. To create the lighter squares, I first stamped off onto scrap paper before pressing down onto my red card. I usually take more time to make sure the plaid is perfect, but I eyeballed everything here. I wanted it to look homespun and hand-painted. To finish off the plaid, I inked up some stripes in white ink. It looks so cozy! 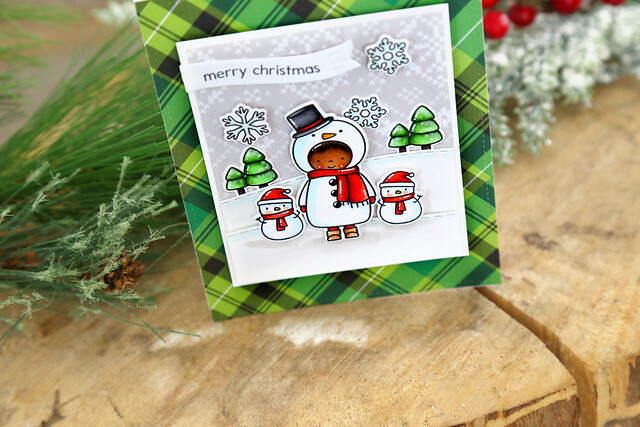 The focal image snowman is from my other favorite set, Snow Buds. I colored his scarf, hat and mittens to match the background. I dangled his mittens again like I did in *this card. * I love the look! The only sentiment I needed was from the Neat and Tangled set, Stay Cool. I overlapped the mittens onto the sentiment and adhered them to a kraft-colored circle. I used a white paint pen to color the outside edge of the circle, and dotted little snow flakes to the inside. 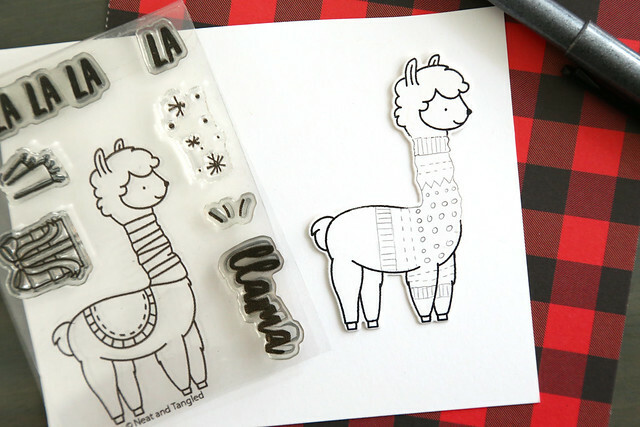 I could help but stamp the Santa from Elfs And Their Shelf, and have him ride on the llama's back. 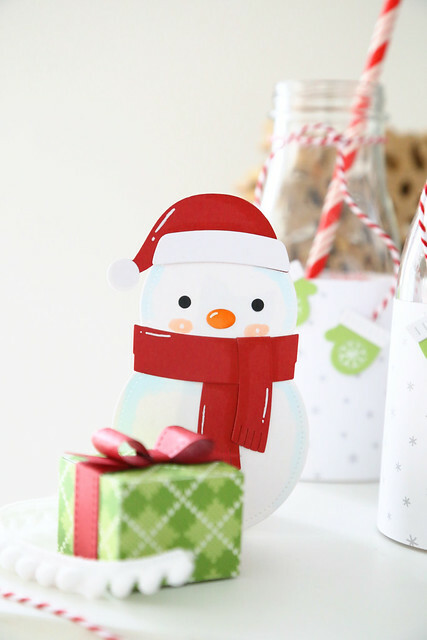 I also stamped out the little snowman from Snow Fun, and tucked him behind a gift. 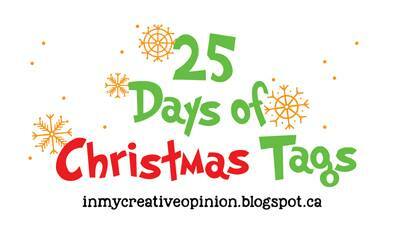 I'm thrilled to be participating in Tracey Mcneely's 25 Days of Christmas Tags again this year! There are sponsors for every day of the event, and today's sponsor is Lawn Fawn. 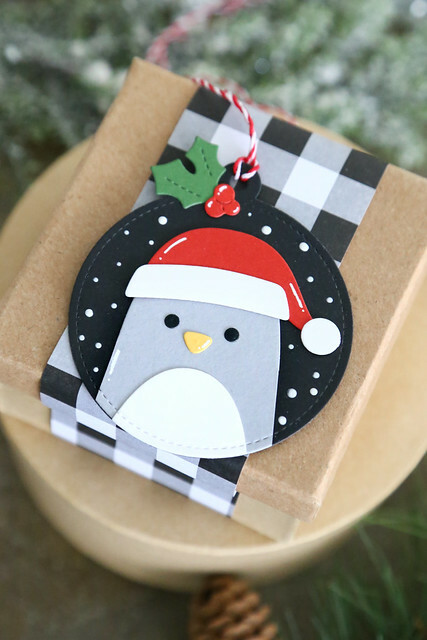 I used a Stitched Circle Tag for my tag base, and created a penguin using Woodland Critter Hugger Dies and the Woodland Critter Hugger Winter Add-Ons dies. I used the belly die from the Woodland Critter die set to create the body of my penguin, and again the tip of that same belly die to create his belly. The rest is more straightforward! 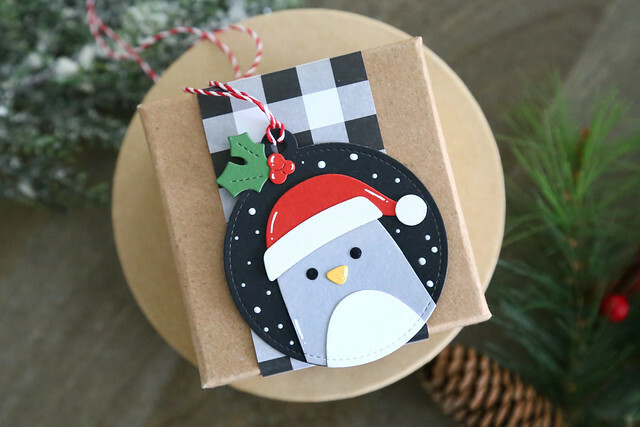 The Santa hat fits perfectly onto his head and the holly-and-berry accent at the top of the tag adds a cute final touch. I scattered white enamel dots all around to look like falling snow. I hope you like it! Be sure to visit Tracey's blog this morning for a list of participating designers - click! 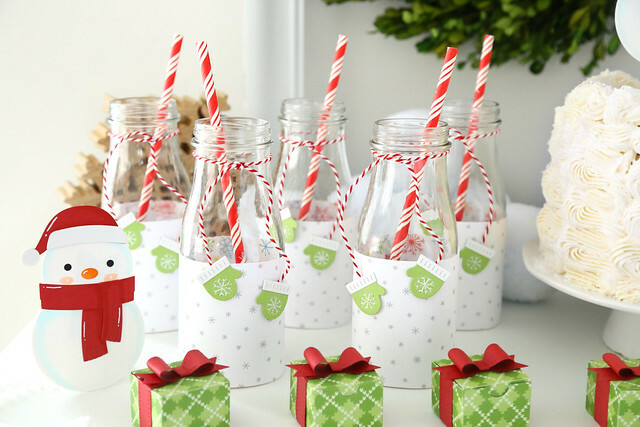 I'm here and on the Lawn Fawn blog this morning, with some fun ideas for a Christmas snowman party. It just started snowing here last week, so I am definitely in the mood for all the holiday things! 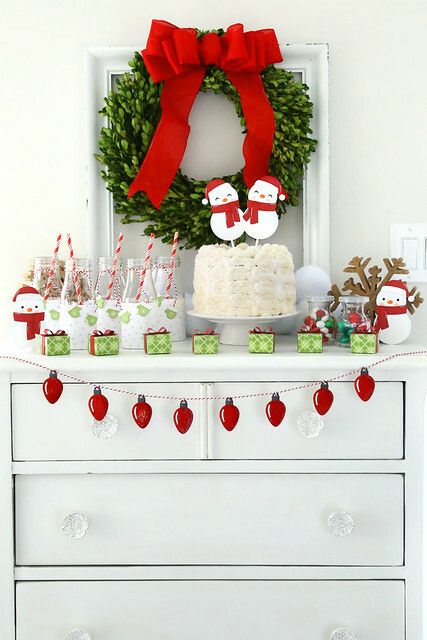 I went with a red and green color scheme - it is so bright and cheerful! 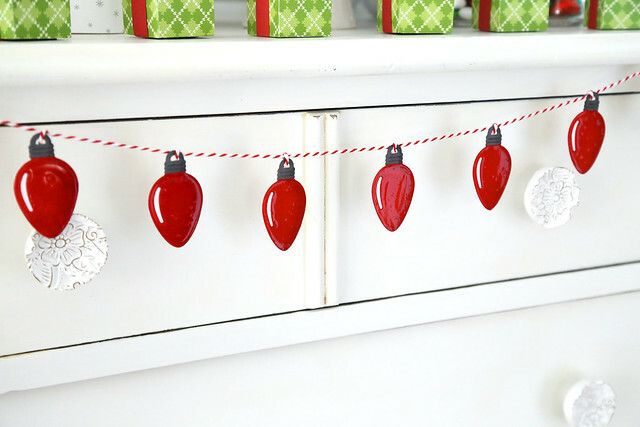 The banner was created using the String of Lights dies, and I added glossy accents to each one so they really shine! I strung them up onto some Peppermint Cord. To keep the lights facing forward, I added a loop of twine to each light, securing it in the back with some tape. 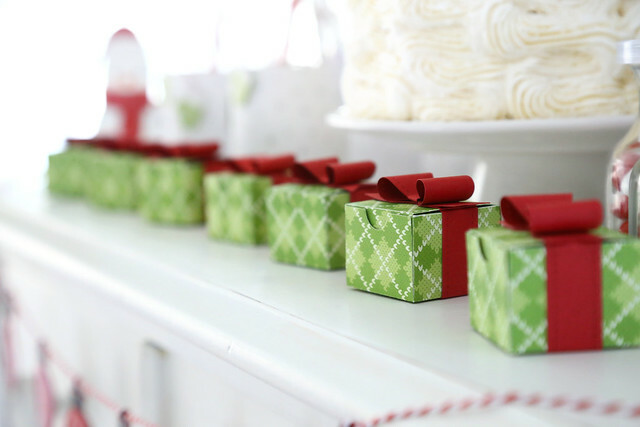 I created little favor gifts using the Tiny Gift Box die and topped them with red bows using the dies from Gift Box. 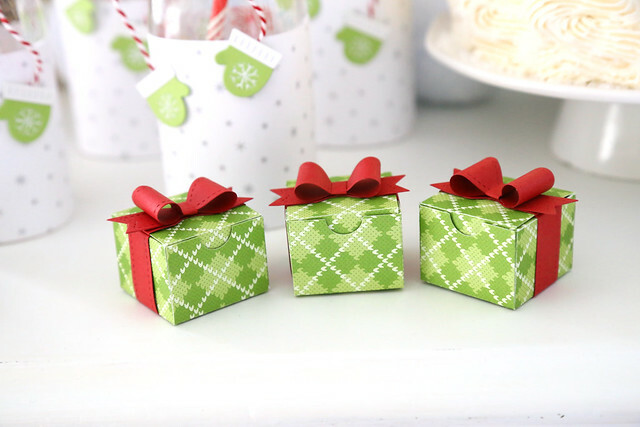 The green argyle patterned paper is so cozy! And they looks so pretty, all in a row. It's really hard to tell from the photos, but I iced the cake in rows of vertical waves and then threw some clear sanding sugar onto the entire cake. It looks like freshly-fallen snow. It really sparkles! 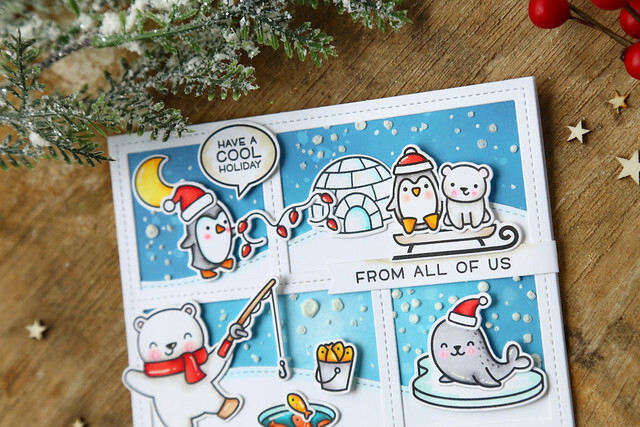 To create the snowmen, I used 2 circle dies and accessories from both Woodland Critter Huggers and Woodland Critter Hugger Winter Add-Ons. I just think they are adorable! I got the idea from Yainea, who inspired me with her card last week. 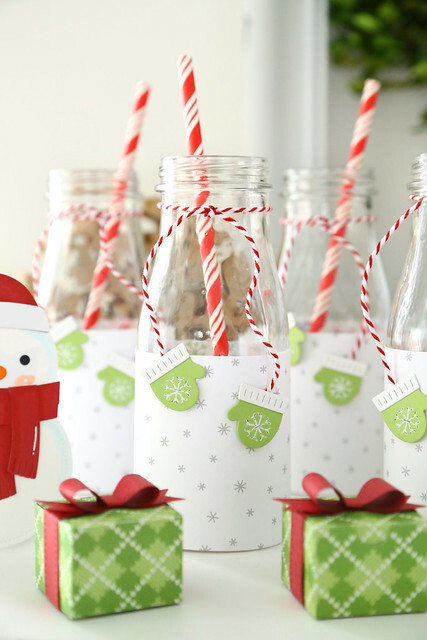 To dress up the milk bottles, I cut some snowflake patterned paper and wrapped it to cover the bottom half of the bottles. Then, I dangled little mittens from more Peppermint Cord. I used a white gel pen to trace the snowflake pattern on the front of each mitten. It looks like a stitched snowflake! 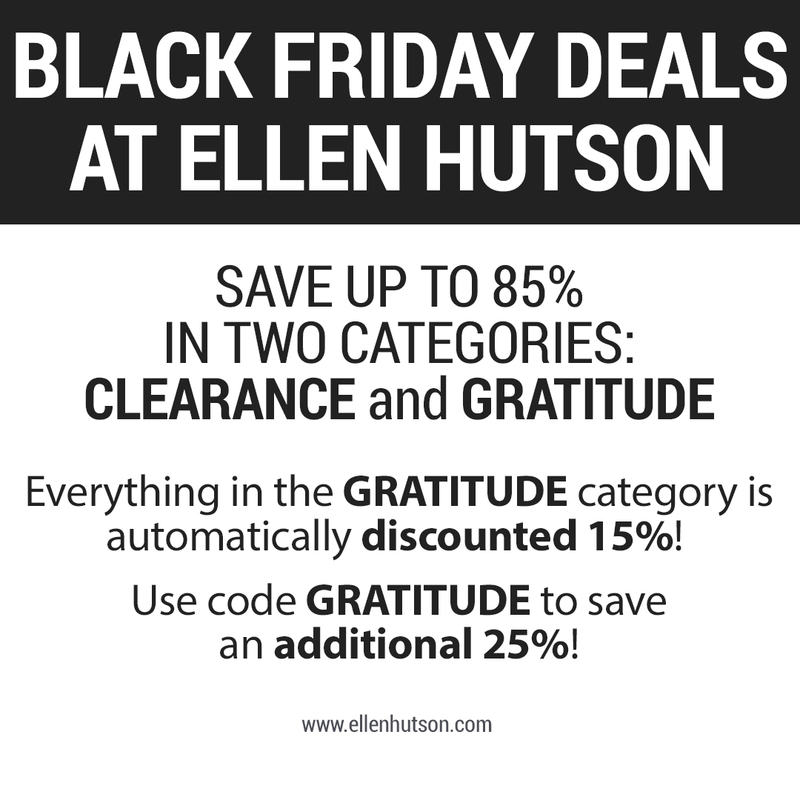 I hope this starts your wheels turning for your own holiday parties! Thanks for stopping by! There are sponsors for every day of the event, and today's sponsor is Neat and Tangled. I am loving a red, black and white combo for Christmas this year. The snowman, from Snow Fun, is so cute looking down at his little friend. 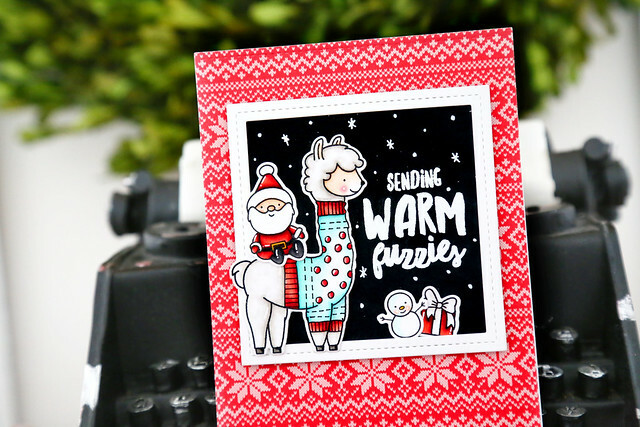 The little speech bubble with the heart in it is from Oh Deer, and the sentiment is from Christmas Sentiments. 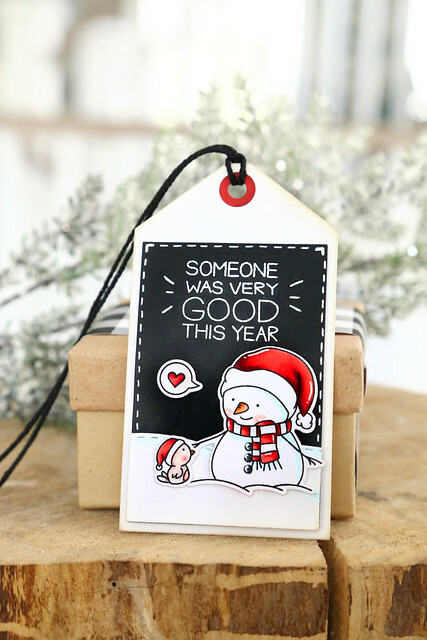 I used the Build A Tag die set to create the tag. I used the Peekaboo Backdrop to frame out little wintery scenes. I used different holiday sets for the critters, including Toboggan Together, Sealed With A Kiss, and Beary Happy Holidays. I added the sentiment and speech bubble from Say What? Christmas Critters. After the entire card was assembled, I decided that it was missing something, so I grabbed a snowfall stencil and some texture paste and tried my best to work around the images and frames. Not my best move, haha. I was sweating a bit, but I think it worked out ok. Thanks for stopping by! Check out the LF blog this morning for more projects - click! 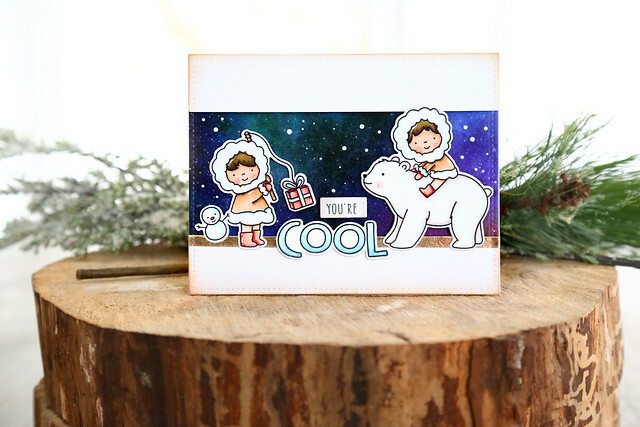 I'm here and on the Neat and Tangled blog this morning, with a card that features a set from our newest release, Stay Cool. I added warmth to the polar bear using light grey markers (W3, W1 and W00,) but I was very light-handed with the coloring. I left most of his body uncolored and just gave shadows where I thought they would be. For the background, I used a piece of Altenew's Nebula washi tape, and also grounded the image using a piece of their Golden Edge washi tape. I added some white enamel snow dots to the night-sky background to finish things off. Neat and Tangled release week wrap-up! Just a note to say that all new products shown this week are available for purchase right now! 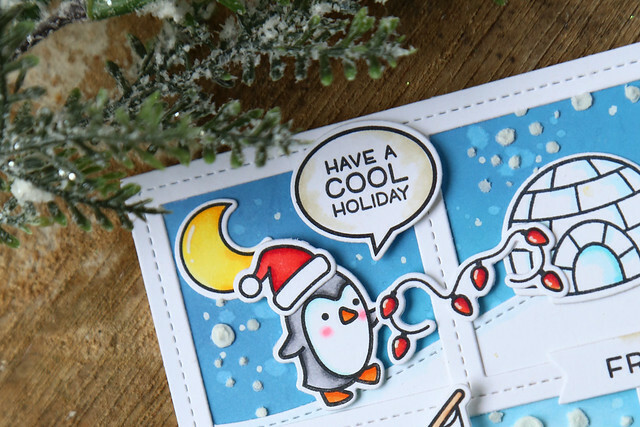 Including my designs: Stay Cool, Snow Fun, and the Penguin Treat Holder die! 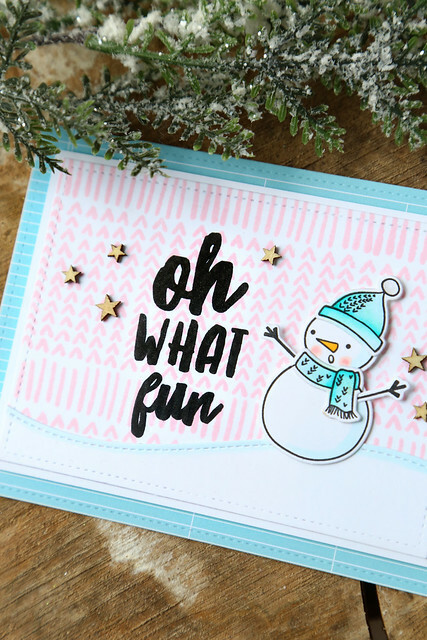 As well, Neat and Tangled has collaborate with Benzie Design to bring you some fun dies, just in time for holiday crafting: an ugly sweater stitching die set, and a snowflake stitching die set. 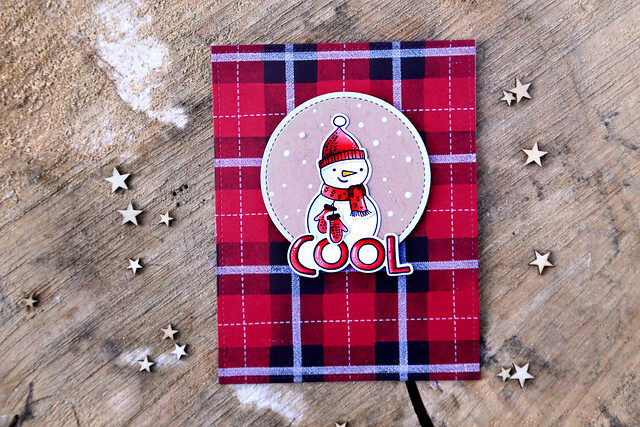 There are some gorgeous inspiration projects on the NT blog this morning - click! If you're looking for my Neat and Tangled post, just scroll down. They are so quirky and cute, and I think it's the little one's birthday. 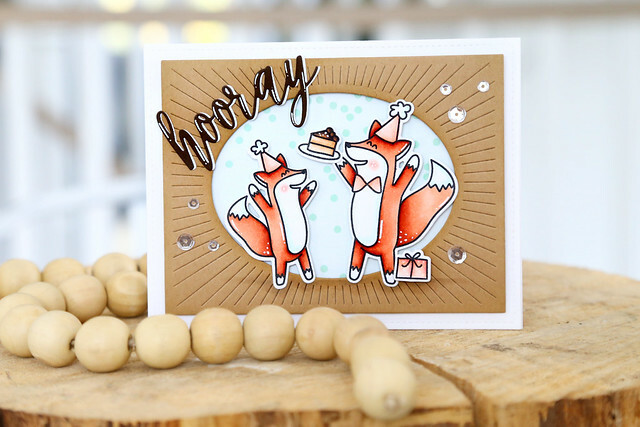 I colored them both using my favorite "foxy" copic marker trio: E11, E13 and E17, and set them against a confetti patterned paper background. I then framed out the images using a kraft-colored Oval Burst die. I used a warm grey copic marker to add a bit of shadowing under the foxes feet, and added a die-cut sentiment to the top of the oval. 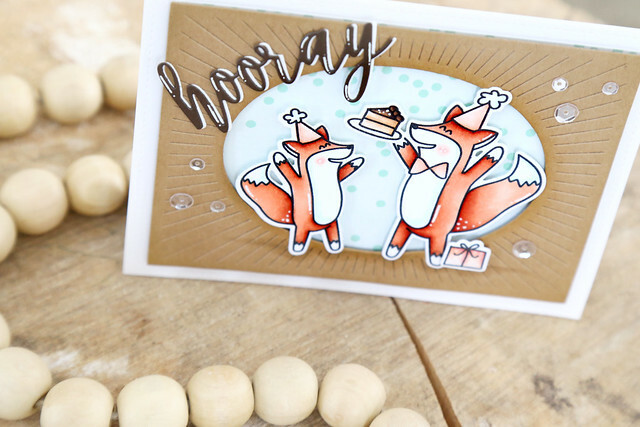 I curved the Hooray sentiment slightly, to fit the curve of the oval, and layered a dark brown die-cut over a white one. I thought this complemented the cartoon-y foxes very well. 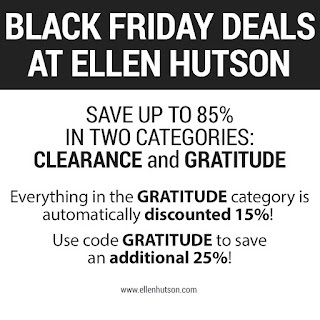 The contest is open until November 11th, at midnight. Good luck! All of the new products are already in the shop right now! On this last day of Neat and Tangled's November release week, we're showing off a 3x4 set that I designed, called Snow Fun. 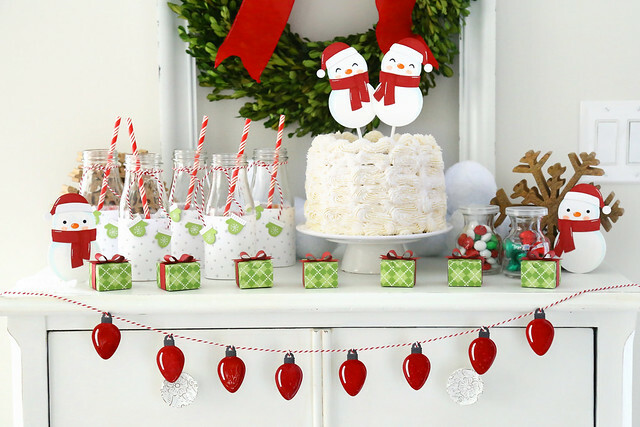 The set features a snowman with an outstretched twig arm - a perfect spot for the sweet bird to perch! 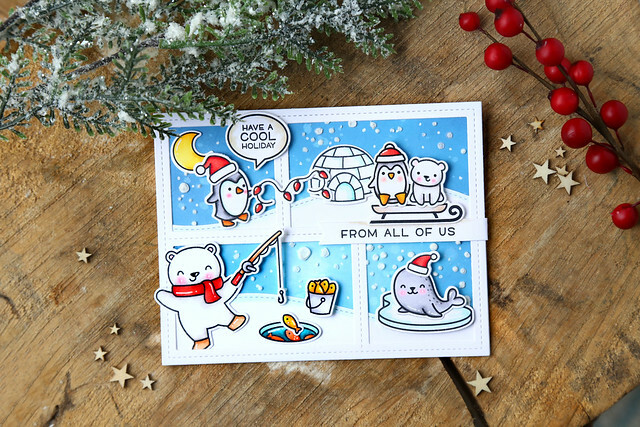 I colored the snowman and the bird, with their matching Santa hats, and set them against a night sky. 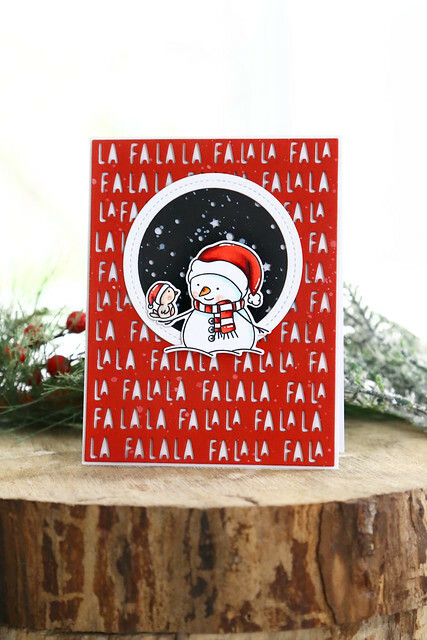 I used Lawn Fawn dies for the sky and the white circle frame, and set everything onto a Fa La La coverplate background. No sentiment needed! 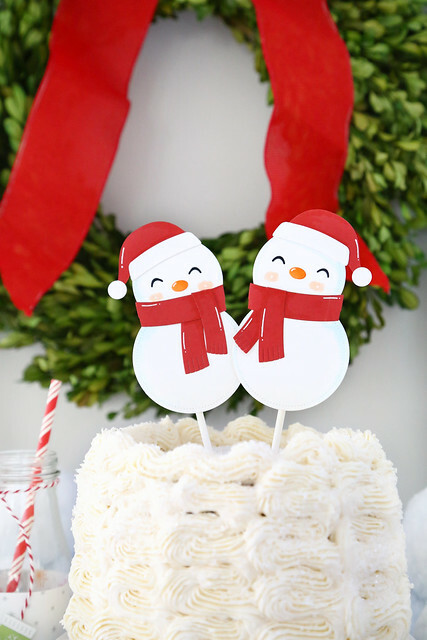 Snow Fun also features a tiny snowman and a present, if you'd like to vary what gets perched onto the twiggy arm. 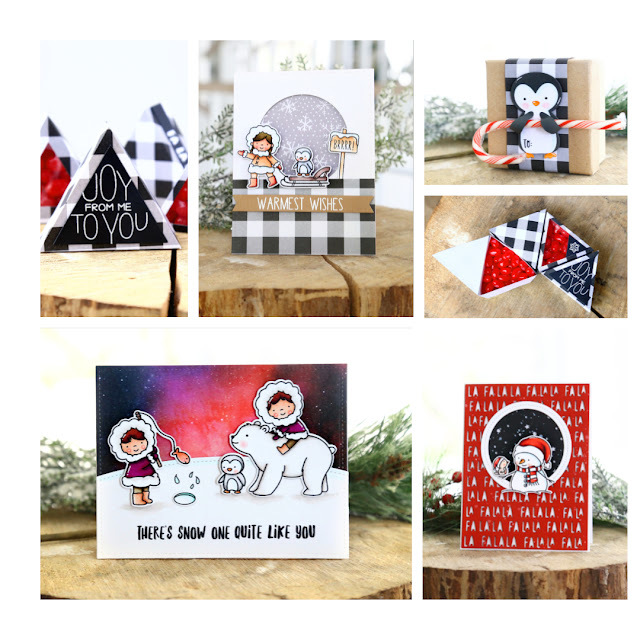 GIVEAWAY: as usual, leave comments on all of the participating design team's blog posts all week long - Danielle will choose one comment at random to win a $25 store gift card. The winner will be announced on Friday morning, just before all of these new products hit the store! Welcome to day 3 of this month's Neat and Tangled release week. 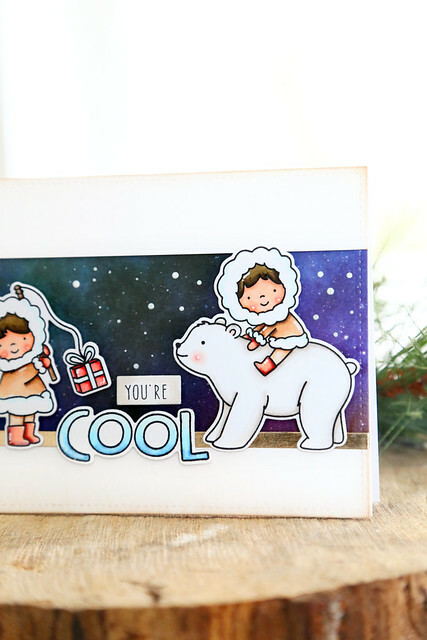 Today, we're showing off a stamp set I designed, called Stay Cool. It features a few cold-weather critters, and some heavily-dressed little kids. 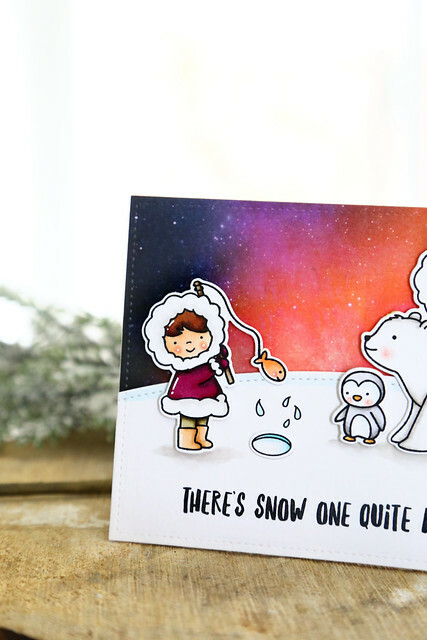 I have 2 cards to share with you today, because this set is so much fun to color! 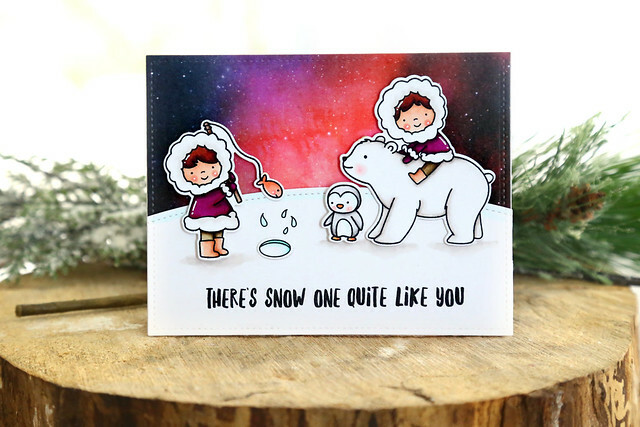 My first card features 2 of the kids in a little winter scene. 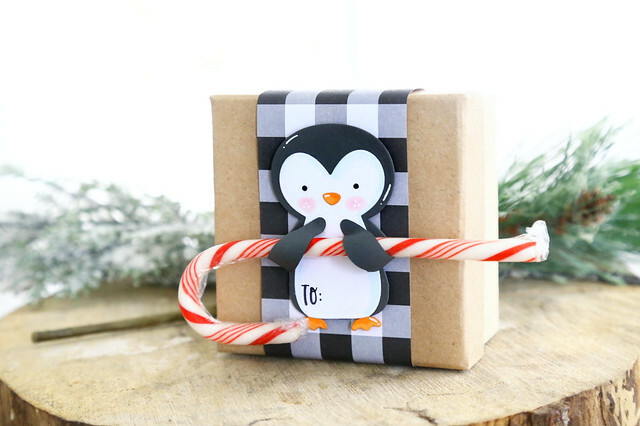 The one on the left can ice-fish either the fish or a gift, and I love how the penguin is looking on. For the background, I used an amazing washi tape by Altenew (click!) I love how it looks like dancing northern lights - perfect for this wintery scene! I colored the kids' parkas a fun burgundy and gave them some shading under their feet. My second card shows off the last little girl. She comes pulling the sled, and I've added a riding penguin. The little BRRR! 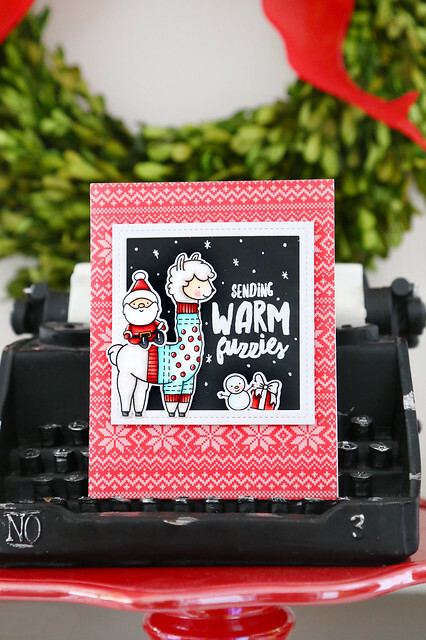 sign was borrowed from a set you'll see tomorrow, and the sentiment comes courtesy of the Merry Kisses stamp set. I hope you like what you see so far! Be sure to check out the Neat and Tangled blog this morning for more inspiration - click! Isn't he cute? I see a lot of little critter dies out there, that can hug treats, but none where the arms fold up. I thought that gave him a cute little shy quality. The die is designed so that he can long, skinny objects - a holiday pencil (or a valentine's day pencil! I'm thinking ahead!) a candy cane, or even rolled-up dollah billz. 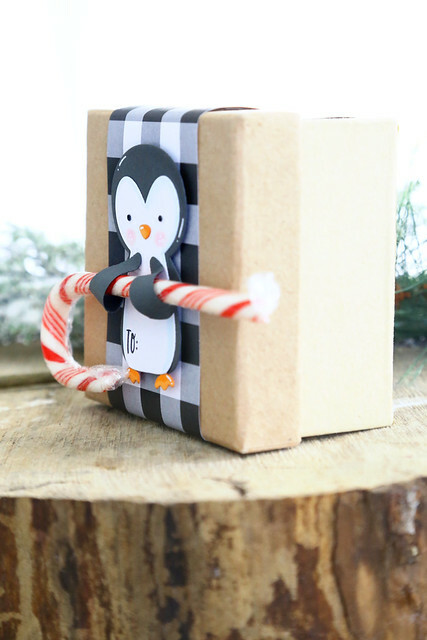 You could add a little topper to his head and string him onto a gift, or pop him onto a larger tag shape, but I stuck him directly onto the little gift box. I think he is so sweet, and I hope you do too! 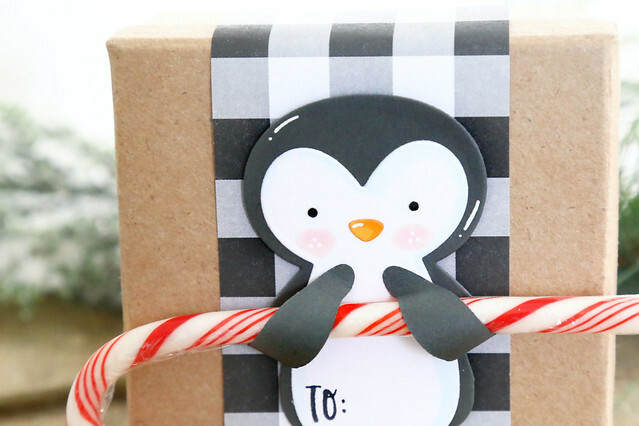 My daughter and I will be churning out a slew of these to hand out to her classmates for Christmas! I am so excited to kick off this month's Neat and Tangled release week - it is my favorite of the entire year, and I know you will love it too. I love all of the little dies that come with the gift box! I made a collection of boxes that work together, but that are all a little different. 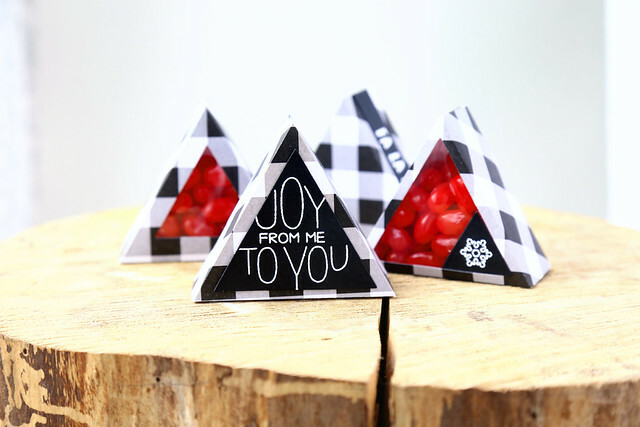 And I have to admit, I just love this triangle shape! 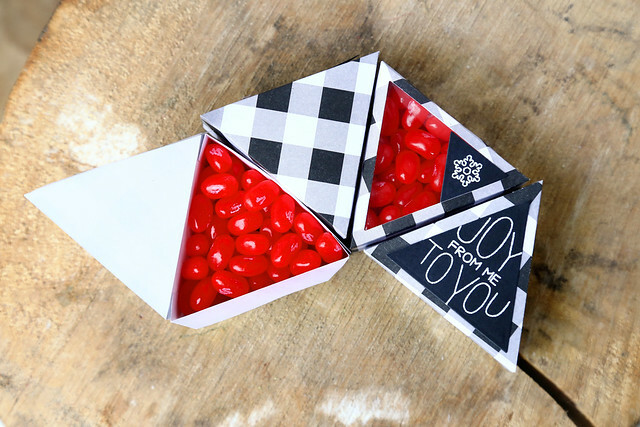 I have a lot of rectangle and square favor box options, but this is something different. 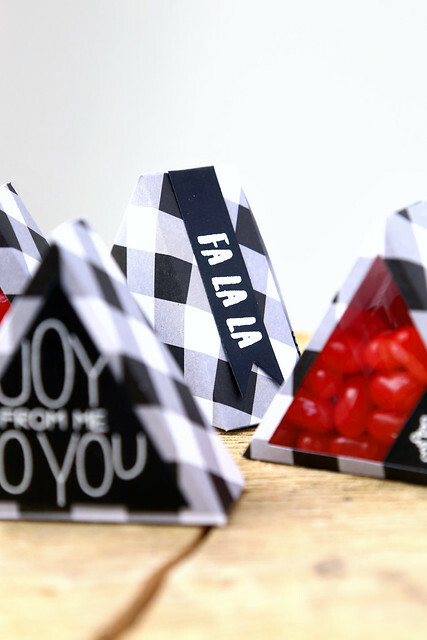 I used one of the triangle dies to cut into the box, and a smaller triangle to add a little snowflake accent to one corner. The box at the back was simply treated to a sentiment flag. 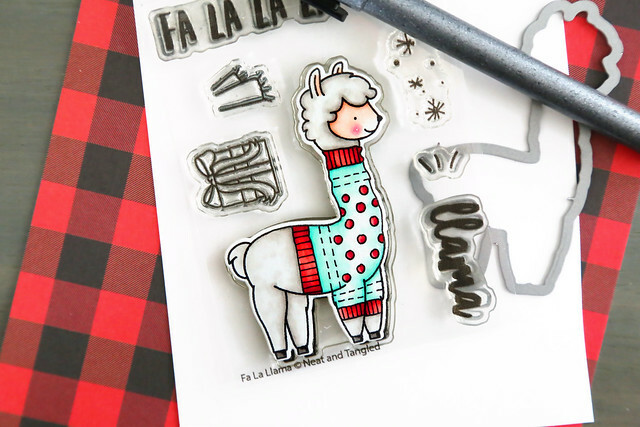 The Fa-la-la sentiment is from Fa La Llama. 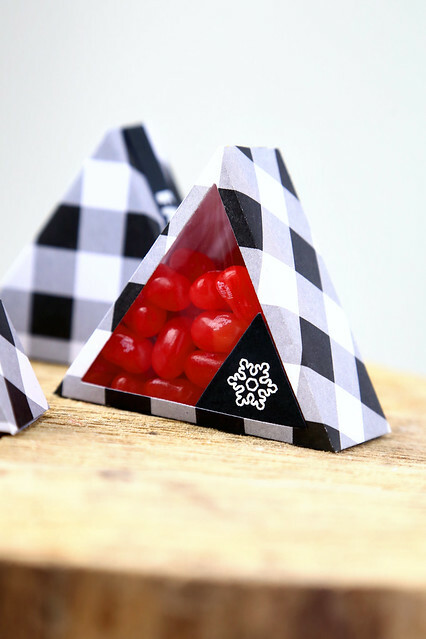 I kept the boxes all black and white, but the bright red jelly beans added a pop of Christmas color. I miss those jelly beans. They were very delicious. I hope you like what you've seen here so far! There is more to see on the Neat and Tangled blog this morning - click! I love him holding the hands of his teeny snowman friends, and they are all dressed up in their red scarves and winter hats. Can we talk about his skin color? I just think it's so striking to see a darker skin in contrast to the white of the snowman costume. Like a darker skinned bride in a glorious white dress. So beautiful! As opposed to how pasty I looked on my wedding day, haha. I need to make more of an effort to show more diversity in my coloring, and I will make a point of being more conscious of it. My husband is Indian, and my own kids have darker skin. Every single time I color an image to "look like them" they comment on how cute it is. That being said, I do find it harder to find a good copic combination for darker skin. If you color, can you share your faves? I used E55, E57 and E59 here and I think it's perfect. I added some green trees (from Bunny Slopes) and a few stamped snowflakes to the background, and then popped everything onto a green plaid background. It's my favorite card of the season so far! 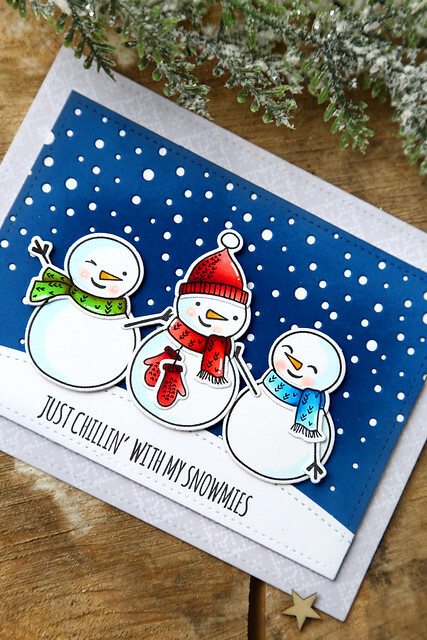 I used the new Snow Days set, as well as the set from yesterday's peek, Snow Buds to create this fun card. I used 2 of the pattern strips from Snow Days to create a pink background. It looks like a cozy knitted sweater! 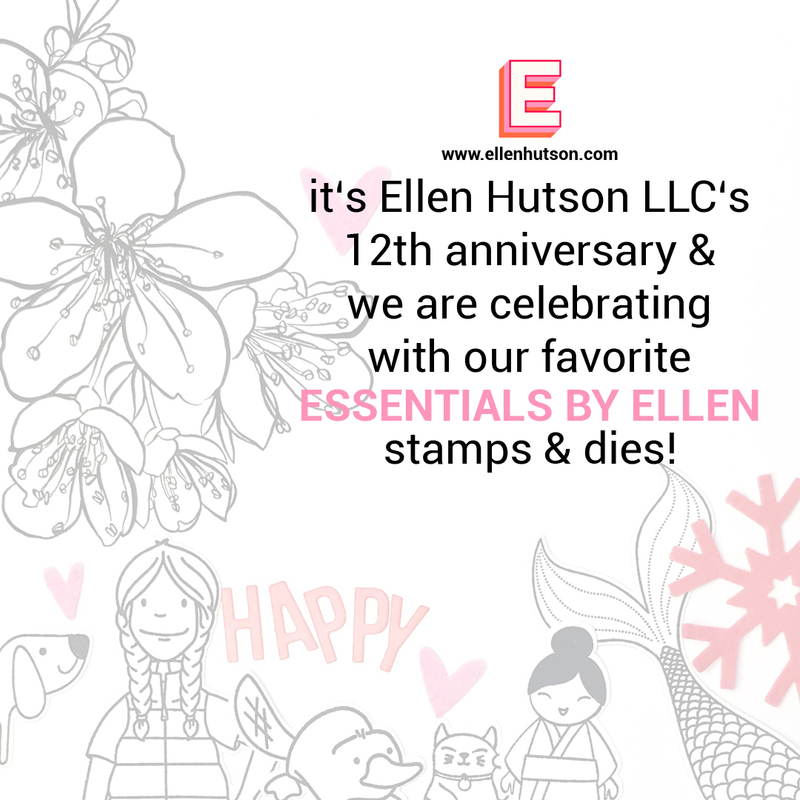 I then stamped the graphic sentiment in black ink right overtop. 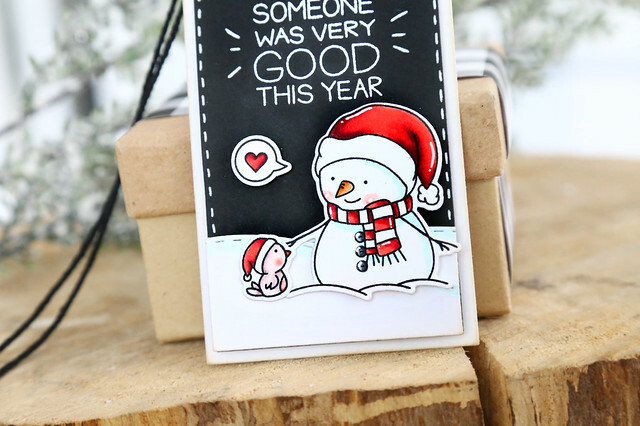 The snowman, from Snow Buds looks like he's actually saying the sentiment out loud! I love his little open mouth. I colored his hat and scarf in blue, to keep the color scheme soft and girly. 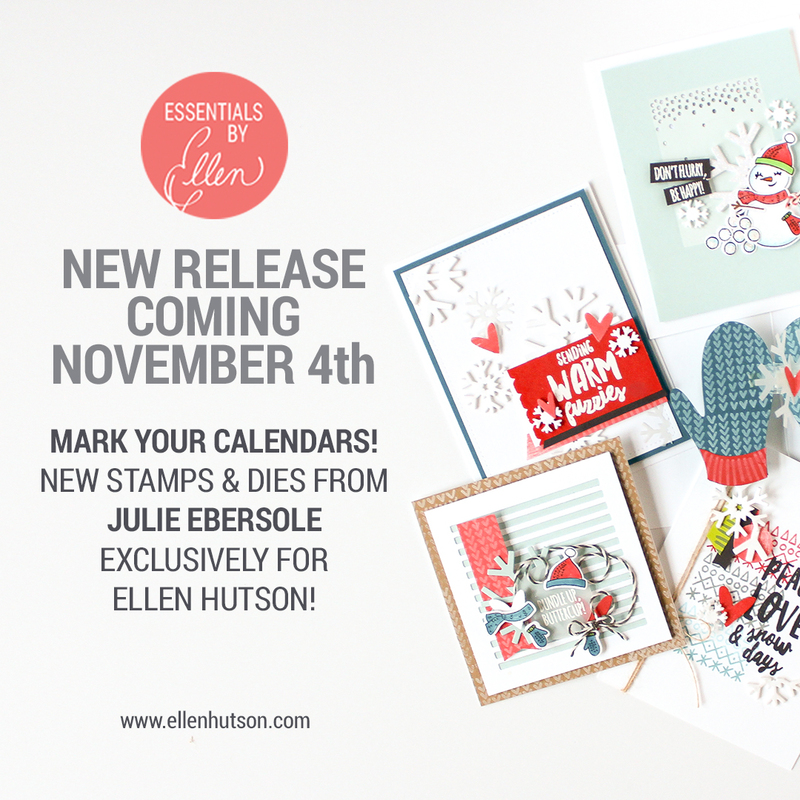 I'm thrilled I get to share an Essentials by Ellen sneak peek - you will love this winter collection! Aren't they the cutest? I love them. 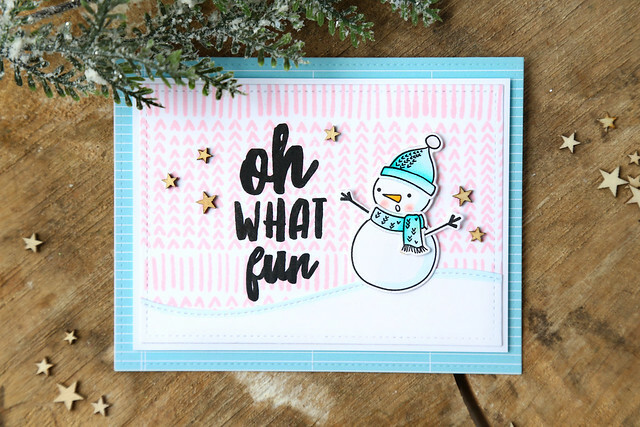 I stamped out 3 snowmen, and gave them different faces and accessories. They take on different personalities, just by altering the faces and where you stamp them! 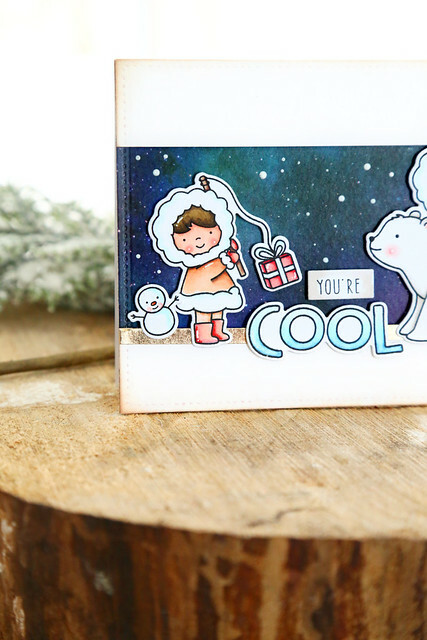 I set them against a navy cardstock that was die-cut using Lawn Fawn's Snowy Backdrop die. I edged the corners of the navy paper with a white ink to create a little bit of a hazy sky. I placed their stick arms to make it look like they are throwing their arms around their friend in the middle. ha! The sentiment works so perfectly with this scene. 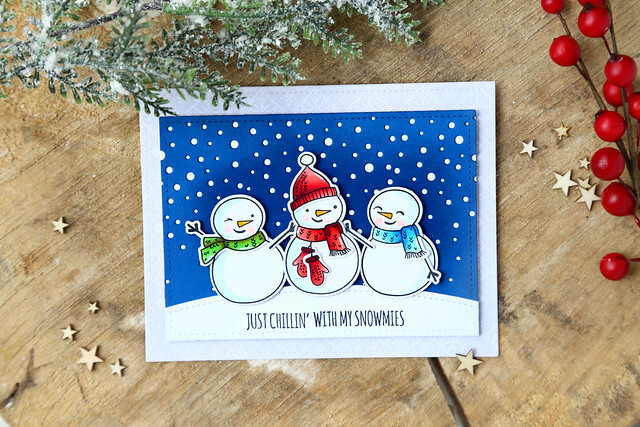 I hope you've enjoyed this first look at Snow Buds! I have another card to show off tomorrow!